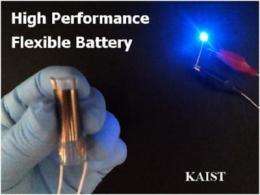 The Korean team of Professor Keon Jae Lee from the Department of Materials Science and Engineering, KAIST has developed a high performance flexible all-solid-state battery, an essential energy source for flexible displays. Flexible battery turns on blue LED and maintains voltage during bending/unbending conditions. More information: See paper in Nano Letters: "Bendable Inorganic Thin-Film Battery for Fully Flexible Electronic Systems"